Get it from Unreal Engine Marketplace or itch.io! 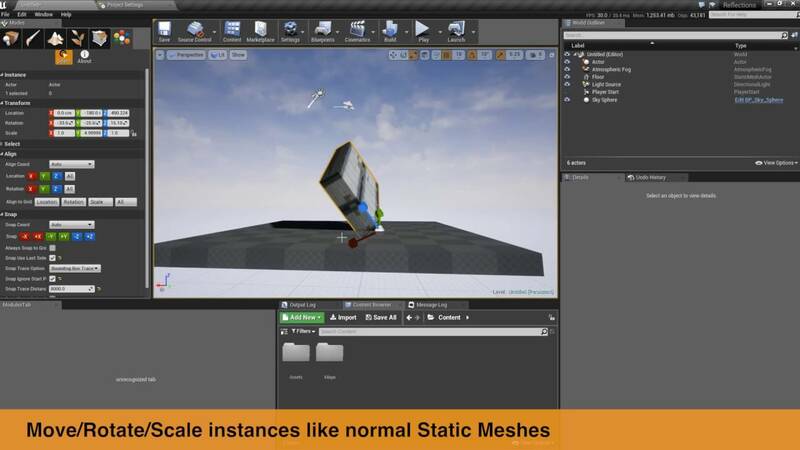 Instance Tool is an editor mode plugin for Unreal Engine, with it you can manipulate instances of Instanced Static Mesh Component and Hierarchical Instanced Static Mesh Component directly in editor viewport. It also comes with align and snap tools to make level editing with instances much easier! Last edited by Nate; 09-19-2017, 09:58 PM. [MENTION=1680]motorsep[/MENTION], thanks! 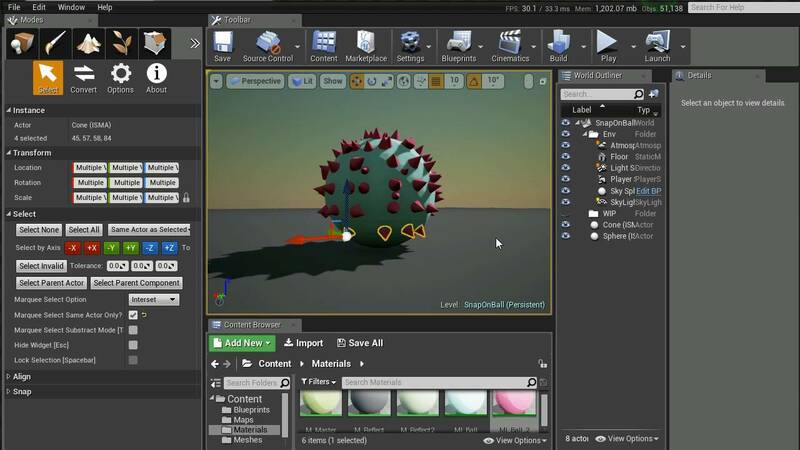 The initial version is focus on more general level editing features with instanced static mesh like select/move/rotate/scale/align/snap/multi-edit, that been said, adding placement/painting feature sounds a very good idea, will definitely consider. This could be even more useful in combination with Rama's ISM conversion tool, here's hoping they both work well together! I'll be picking this up when it hits the Marketplace definitely. This looks great. Can you edit instances placed with the Procedural Foliage Tool or Foliage Mode with this? Can you edit instances placed with the Procedural Foliage Tool or Foliage Mode with this? No, you have to use Foliage Mode tools to edit Foliage instances since there're very specif logic and data structures behind Foliage instances editing. It's technically possible to add Foliage instances support to Instance Tool (it was enabled in the initial test verison), but that means many duplicated code between Foliage Mode and Instance Tool Mode which could be messy and might not survive future engine update if implementation detail of Foliage Mode changed. Is there any specifc functionalities Instance Tool has but lacking in Foliage tools? I think I can try extract them and submit pull requests to epic for them to consider merge in. Would be nice if this tool would also generated (hierarchical) instanced static meshes based on the original static meshes with actor tag (HISMCs don't work on mobile, so ISMCs is the only option for now). For example, if I place 5 rocks and 10 pillars on the level, then select 5 rocks and press a button, an instanced static mesh BP would be created, containing 5 instanced of the rocks (with option in the Details panel to hide/unhide original meshes). Same goes for pillars. Is it something you could add to your tool? [MENTION=1680]motorsep[/MENTION], yes, that's exactly what I'm working on: adding (Hierarchical) Instanced Static Mesh <-> Static Mesh Actor conversion. In your example, you can select 5 rockes and 10 pillars (there's no need to set tag first), press "Convert Selected Actors to Instances" button, there'll be 2 ISMC/HISMC actors created: one with 5 instances of rock, one with 10 instances of pillars. You can choose to turn these 2 actors into blueprints later. There'll options to hide original actors, or put original/converted actors into folder. I'm also thinking instead of creating new actors each time, there could be option to add instances to an existing ISMC/HISMC actor. aha, sounds like a plan [MENTION=702]Nate[/MENTION] !!! Btw, will you provide pre-built plugin? Will generated (H)ISMCs work on any platform ? [MENTION=1680]motorsep[/MENTION], I'm packaging windows prebuilt plugin binaries in itch.io release (My Mac is too old to handle Unreal). As Unreal Marketplace release, from what I've been told, they have built it on both Windows and Mac, so I assuem it'll be released with both win and mac binaries. PS: RevertMe looks like another great idea! Any news from Epic about Marketplace release ? [MENTION=1680]motorsep[/MENTION], I just released Instance Tool 1.1.0 on itch.io, two major features introduced in this version: ISM <--> SM converter, and Blueprint editing support (experimental). I submited the 1.0.1 version to Epic on Aug 23, and it was accepted and entering "code review" phase on Aug 26. I haven't got any update on the review result since then. According the marketplace stuff I'm contacting, they got lots of code plugins to process, so it might still in the queue. Thansk everyone who purchased Instance Tool on itch, your support really means a lot! And please do let me know if you run into any issues/difficulities when using Instance Tool.